I’m in Taiwan for the Let’s Bike Taiwan 2009, a cycling and cultural tour of the island known as the Republic of China. Today’s ride was a scenic jaunt along the very picturesque Sun Moon Lake. Bikes were provided by Giant, an evermore appropriate name for the Taiwanese bicycle manufacturer. 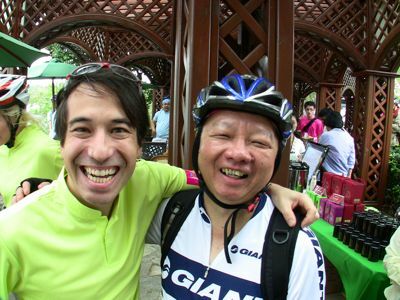 On one of the stops of today’s ride, I shared some tea, grown right here in the Sun Moon Lake area, with the vice president of Giant, James Hu. After being at the forefront of bicycle production, both cutting edge and mundane, the Taiwanese leaders are looking to foster an enthusiasm for riding bikes in Taiwan itself. Has it worked? Actually, cycling has seemingly caught on like wildfire among the people, and bicycle friendly infrastructure in the capitol Taipei is on the rise.